The Snowbird cardigan has been depressing me mightily. It is surprisingly difficult to work on. Aran weight yarn? Thick needles? Stocking stitch? It should have been easy! In practice, the yarn is really not at all elastic. Each stitch is difficult to form. The whole piece has been quite stiff, and awkward to manipulate. The weight of it all on the cable is causing pain in my wrists. The whole process is very slow indeed and I seem to be making little progress. Not yet at the armholes — and I’m travelling downward! Time to step back and take a considered viewpoint. …or, to turn that on its head, there is less effort in front of me than I might have been thinking. 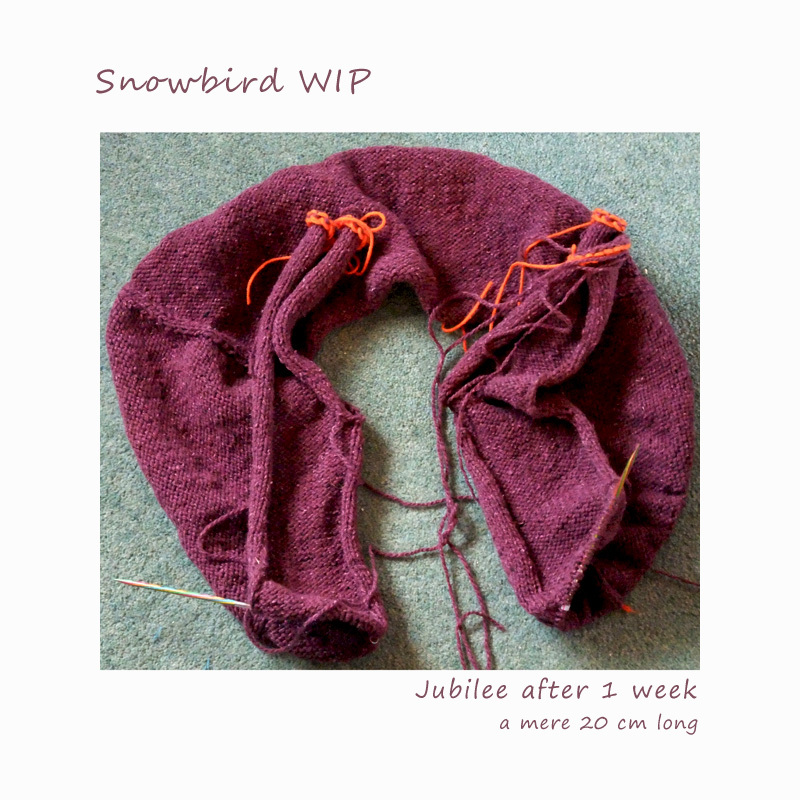 I would love to say that I intend to reach the sleeves today but those 14 rows are going to take a long time to execute and I should be limiting the amount of time that I spend doing them on a daily basis, to reduce the pain in my wrists. It will soon be time to assess whether this project can be completed by 20 July. If not, I’ll draw stumps – and start on something new — and more achievable.